Comodo Dome Secure Gateway is a real-time web security solution which provides protection against internet threats for your customers. The product includes URL filtering, malware protection, Valkyrie real-time file verdicting and portable containment. 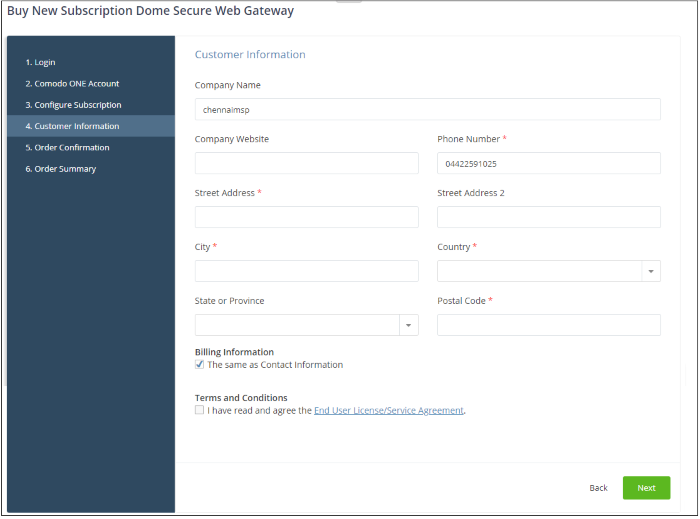 The basic version of Comodo Dome Secure Web Gateway (SWG) is free for thirty days and can be added to your account at any time. You can upgrade to the full product by purchasing a new license from the C1 console. Once you have a Dome SWG license, you can expand the product with Dome Premium add-on modules. Available modules are 'Dome Data Protection' and 'Dome Antispam'. Alternatively, you can add Dome SWG by linking this account to another Comodo account that already has a license. All available applications will be displayed. 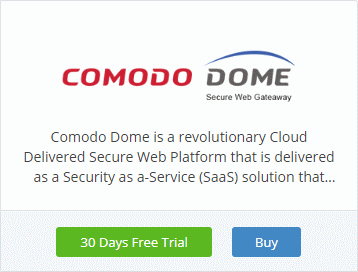 Click 'Buy' or '30 Days Free Trial' depending on the version of Comodo Dome SWG you wish to add to Comodo One. You will be taken to the respective subscription page. The example shown below is for the basic version. Your login username will be pre-populated and cannot be changed. 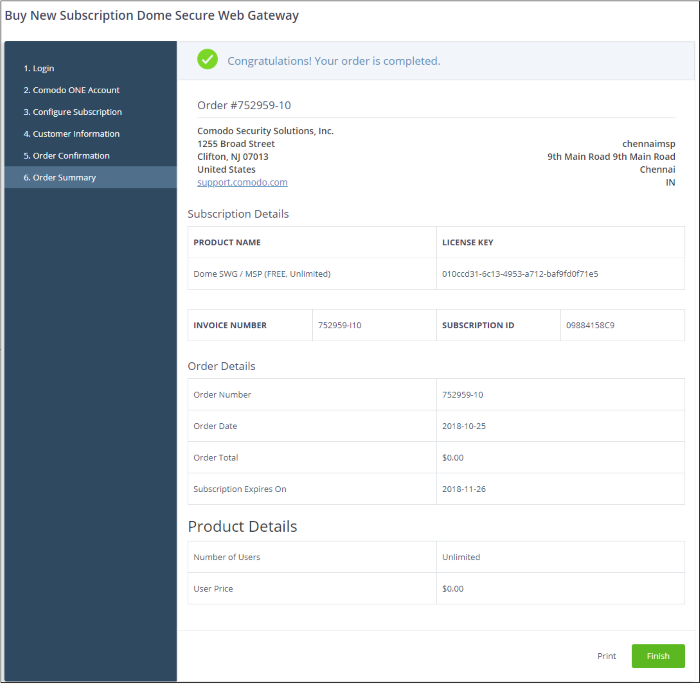 If you opted for a paid version, click the 'Buy New' button in the 'Comodo One Account' page then select a subscription package in the 'Configure Subscription' page . Click 'Next' to provide your customer information. If you opted for the basic version then, after logging-in, the process will jump straight to customer information screen. If you opted for a paid version, you will be taken to the 'Order Confirmation and Payment' page. Review your order, enter your card details then click 'Next' to proceed to order completion. If you opted for the basic version then, the order confirmation page will appear. Your order will be submitted and subscription details displayed. You will receive a confirmation mail with the order details and the license key. Click 'Print' to take a print of the order summary. Click 'Finish' to complete the purchase process. After the purchase is complete, Comodo Dome Shield will appear in the 'Applications' interface. See the description at the end of this section if you need more help to open the Comodo Dome Shield interface. You can activate licenses for your C1 products through the 'Store' interface. You can also activate licenses in linked accounts. To do this, you must first have linked an account and set it as default. See Comodo One License Account Details	for more details on this process. You will be taken to the respective page. Reminder: If you are activating a license from a linked account, ensure that the linked account is set as the 'Default' account. For more details, see Comodo One License Account Details. The username for the default account will be pre-populated. The license will be activated and Comodo Dome SWG will be added to your list of 'Applications'. Click 'Applications' on the menu bar and choose 'All Applications' from the drop-down. All licensed modules for your account will be displayed as tiles. 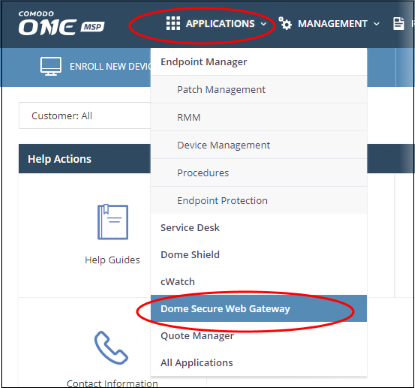 The 'Dome Secure Web Gateway' interface will open in a new tab, or the current tab if configured in 'Settings' > 'Comodo One Application Launch'. See Configure application launch settings	in Configure C1 Settings for more details. 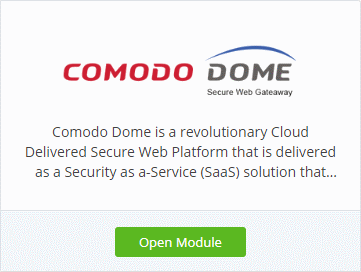 For more help to use Comodo Dome Secure Web Gateway, see https://help.comodo.com/topic-436-1-842-10771-Introduction-to-Comodo-Dome-Secure-Web-Gateway.html.